Caitlyn Stroh, Alex Slitz, Jay Pilgreen and Matt Goins of the Lexington Herald-Leader won first place in the Associated Press Sports Editors 2017 contest for multimedia in the 30,000-75,000 circulation category. Their multimedia entry chronicled a local high school football team’s season-long drive to a city championship. Finishing as runners-up were Tony Paul and Adam Graham of the Detroit News for their entry Larger than life: An oral history of WrestleMania III. 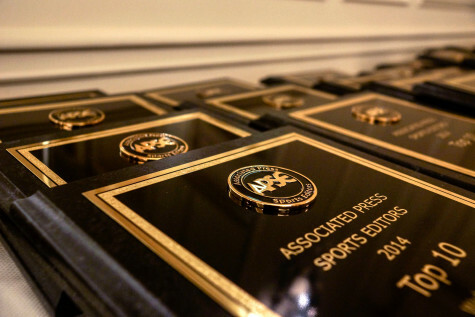 The Herald-Leader’s winning team will be presented a first-place plaque at the 2018 APSE banquet. The banquet and awards dinner concludes the APSE Summer Conference June 17-20 at the Marriott Hotel Nashville/Vanderbilt University. The second- through fifth-place winners will receive frameable certificates. Entries in the multimedia category can make use of interactive graphics, audio, slideshows or combinations thereof, or anything else that falls under the broad description of multimedia other than simple videos. Work is judged on the strength of storytelling. Visual and auditory quality are also considered. This year’s top five entries are listed below, with links to writers’ Twitter pages, APSE member websites and the winning entries themselves.